Porella abdita Canu & Bassler, 1920 Paleogene Eocene Priabonian USA Florida, Poland? A large number of species in this list probably are not related to the type species: some may be be allied to Aimulosia. Porella hanaishiensis at Pleistocene Bryozoa of Kuromatsunai, Japan. Porella compressa at Encyclopedia of Marine Life of Britain and Ireland. Porella acutirostris at Atlas of Arctic Bryozoa - Piotr Kuklinski. Porella alba at Atlas of Arctic Bryozoa - Piotr Kuklinski. Porella aperta at Atlas of Arctic Bryozoa - Piotr Kuklinski. Porella belli at Atlas of Arctic Bryozoa - Piotr Kuklinski. Porella compressa at Atlas of Arctic Bryozoa - Piotr Kuklinski. Porella concinna at Atlas of Arctic Bryozoa - Piotr Kuklinski. Porella fragilis at Atlas of Arctic Bryozoa - Piotr Kuklinski. Porella minuta at Atlas of Arctic Bryozoa - Piotr Kuklinski. 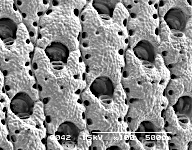 Porella peristomata at Atlas of Arctic Bryozoa - Piotr Kuklinski. Porella proboscidea at Atlas of Arctic Bryozoa - Piotr Kuklinski. Porella smitti at Atlas of Arctic Bryozoa - Piotr Kuklinski. Porella struma at Atlas of Arctic Bryozoa - Piotr Kuklinski. Porella tumida at Atlas of Arctic Bryozoa - Piotr Kuklinski.